Chocolate Bear Claws- First Attempt | I Wanna Bake! 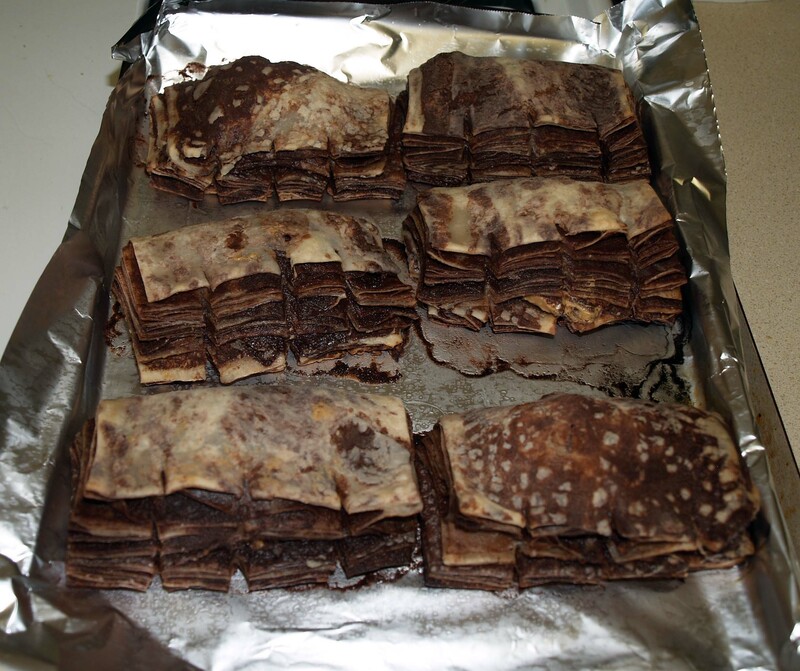 Sometimes, baked goods don’t turn out quite as you planned. This was definitely the case with this weekend’s chocolate bear claw experiment. While they weren’t a complete and utter failure, they were bad enough that I made myself throw 11 out of 12 of them away. Still, just because this pastry flopped doesn’t mean the experience was a complete loss. In today’s post, I’ll go through exactly what I did this time and give some suggestions for future improvements. This recipe took all day and a lot of effort, so I don’t know that I’ll be trying it again anytime soon, at least not quite like this. My bear claws most likely went wrong because I have developed a habit of gathering several different recipes and cobbling them together to meet my needs. I used the ingredients from this recipe for the chocolate puff pastry, but the method from the Joy of Cooking‘s recipe for Food Processor Puff Pastry. I also chose to assemble the claws in a way which seemed to make more sense to me, but does not appear to be the standard method when it comes to bear claw preparation. Having never made these before, I should have just picked one recipe and stuck with it. My hubris got in my way and stomped all over my bear claws. The first task is to make the puff pastry. [This is something I had never tried before, and now I know why. It takes a lot of time and patience.] 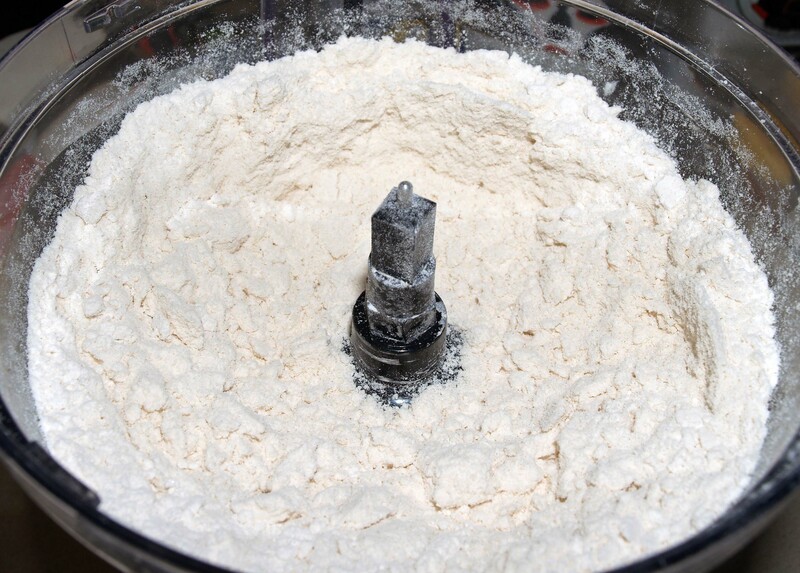 Put the flours and salt in the food processor and pulse to combine. 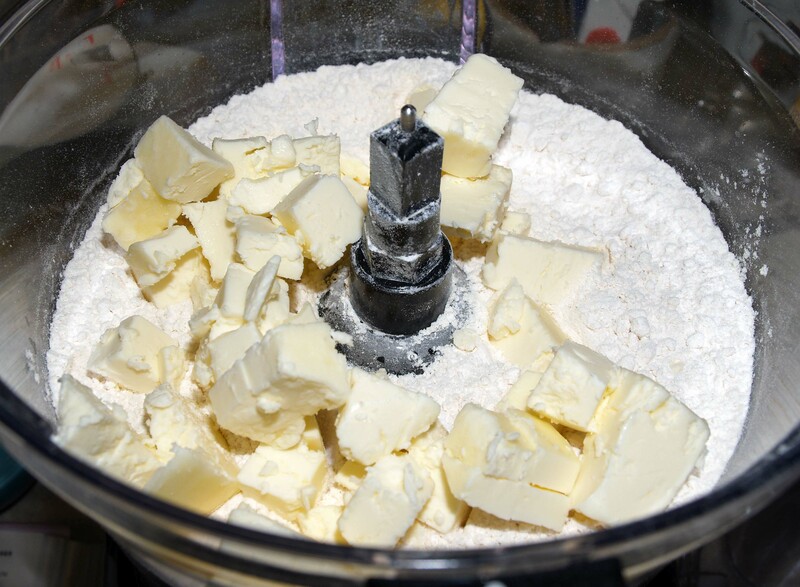 Drop 9 tablespoons of the chilled butter cubes on top of the flour mixture. I’d like to point out that I used fresh butter here, but it probably would have been easier to use store-bought butter. My butter melted too easily, which caused trouble. Pulse the mixture until it forms coarse crumbs. Pour in the cold water and pulse until the dough begins to come together. This should happen rather quickly. 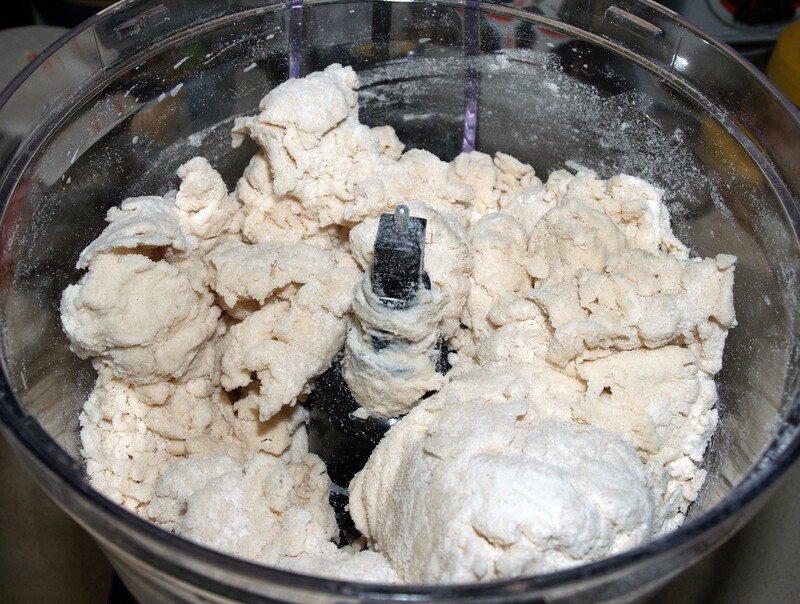 Scrape the dough out of the food processor onto a sheet of plastic wrap. 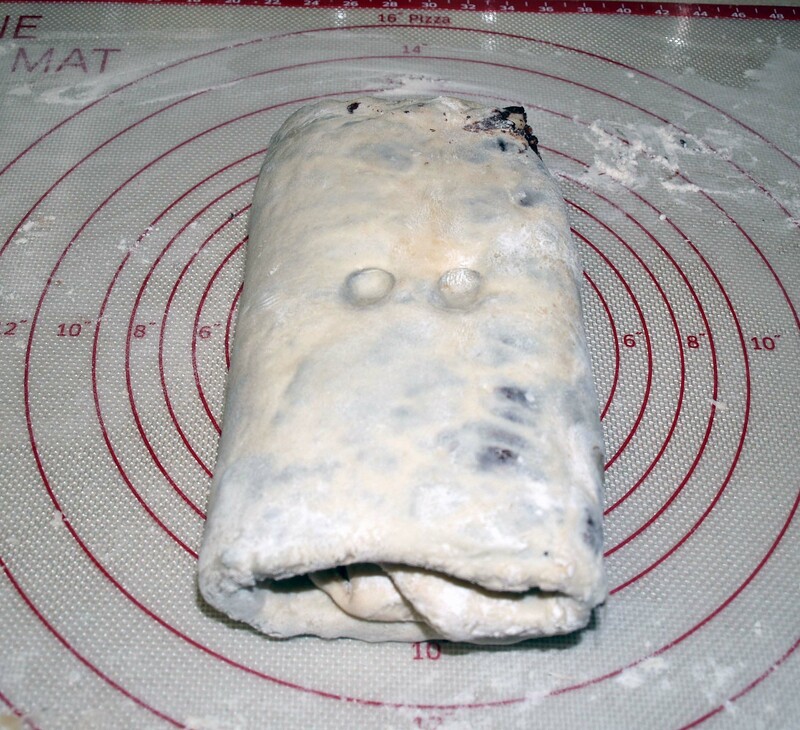 Form the dough into a 6″ square (use the plastic wrap to help shape it) and refrigerate for an hour. 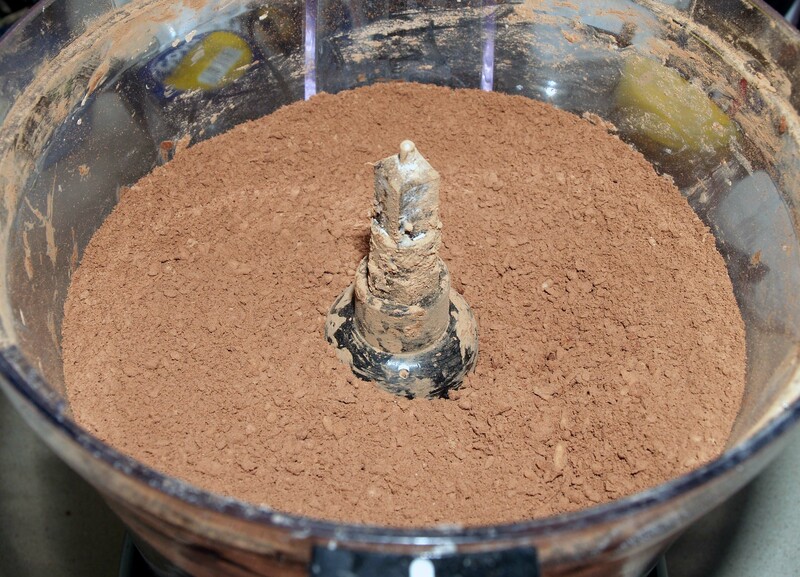 Next, put the cocoa powder and the remaining 30 tablespoons of butter into the food processor. Process until the mixture looks like “fine gravel.” At this point, the recipe says to scrape the sides of the bowl and process until the mixture is smooth. I found that it never got smooth, so I attempted to use it as it was. This didn’t work. After trying to work with this butter block for awhile, I poured the crumbs into a mixing bowl and added a tablespoon of cold water. 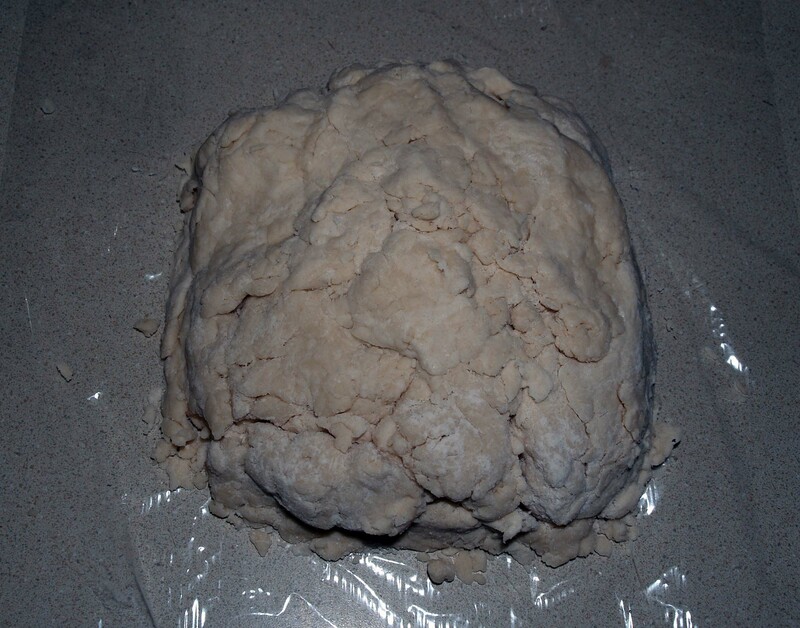 Then I kneaded it with my hands a bit. You’re not supposed to do this for fear of melting the butter, but it had to come together somehow. 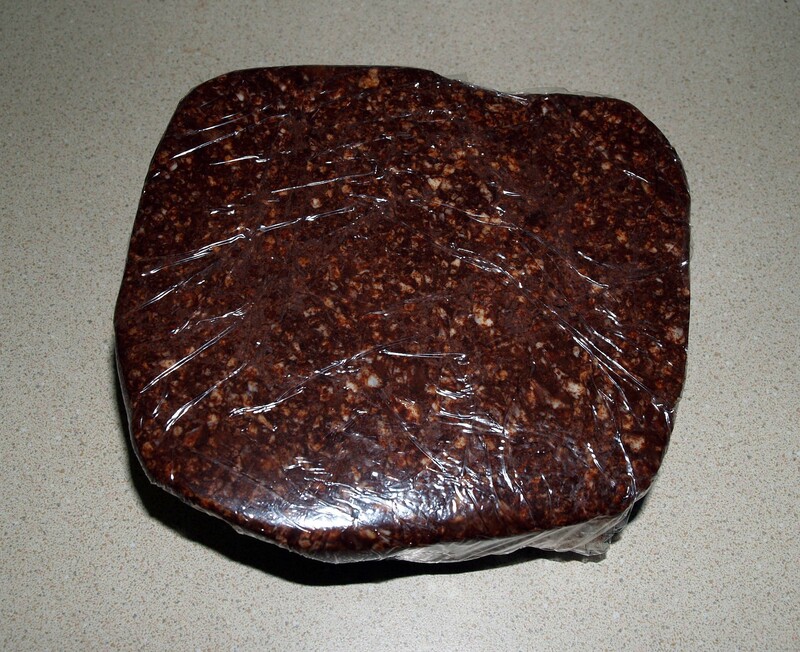 Eventually, I ended up with a gross pile of greasy chocolate butter. 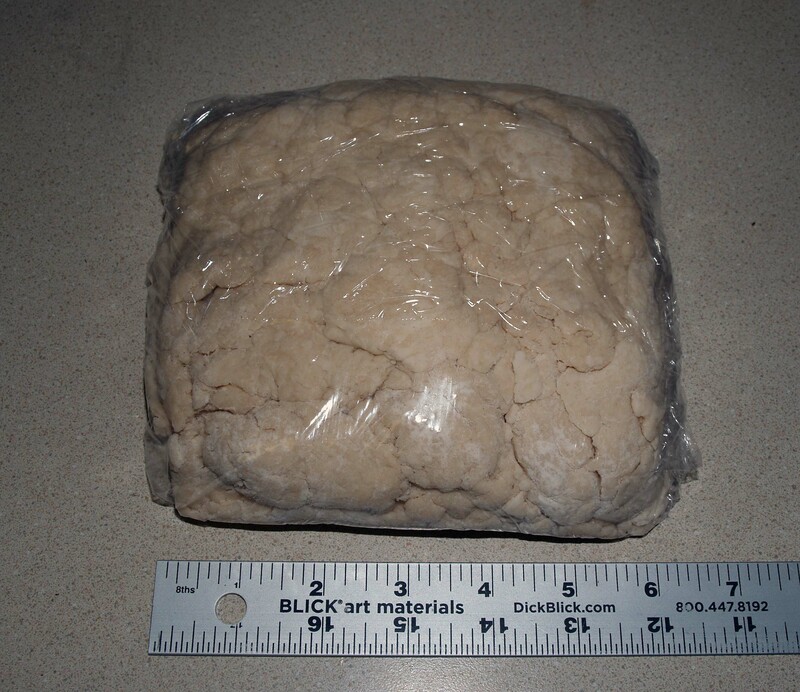 However you manage to make it come together, form this into another 6″ block with plastic wrap and stick it in the freezer until you are ready to use it. 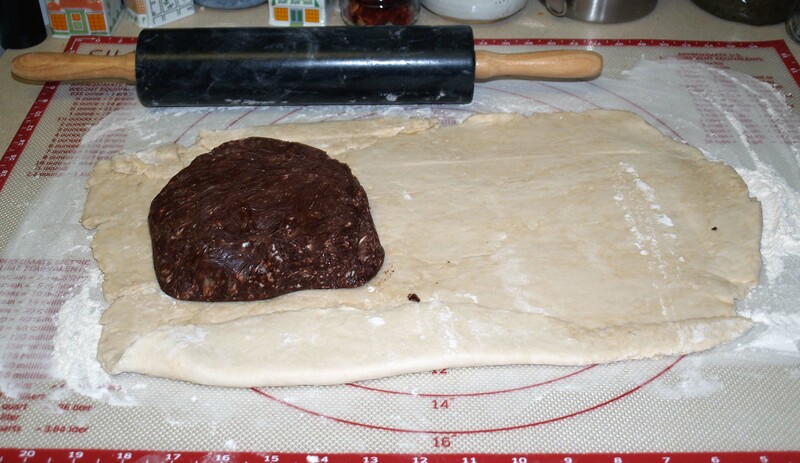 Once the dough has chilled, place it on a lightly floured surface (my silicone pastry mat saved the day here) and roll it into a 13″ by 8″ rectangle. Do your best to straighten the edges. 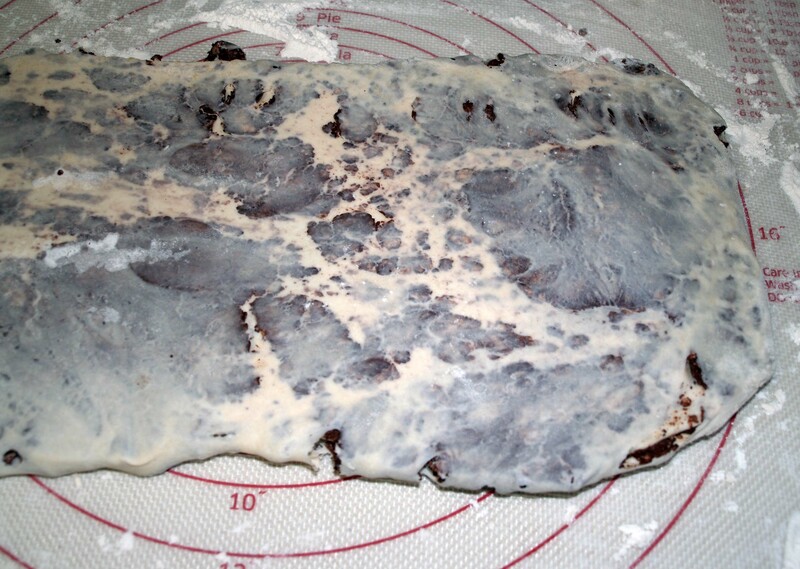 Now take the chocolate butter block out of the freezer and center it on one side of the dough rectangle. 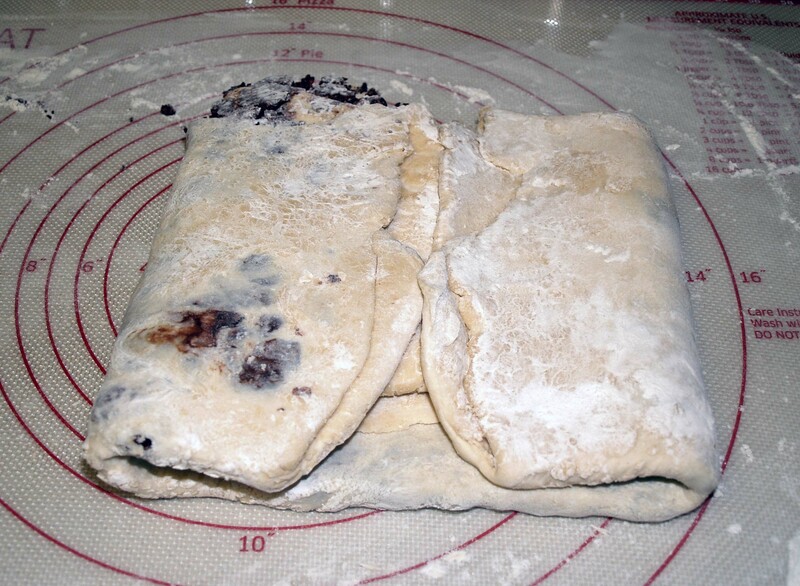 Fold dough in half to cover the butter block and press the edges together to seal it. Carefully roll this packet out parallel to the folded side. 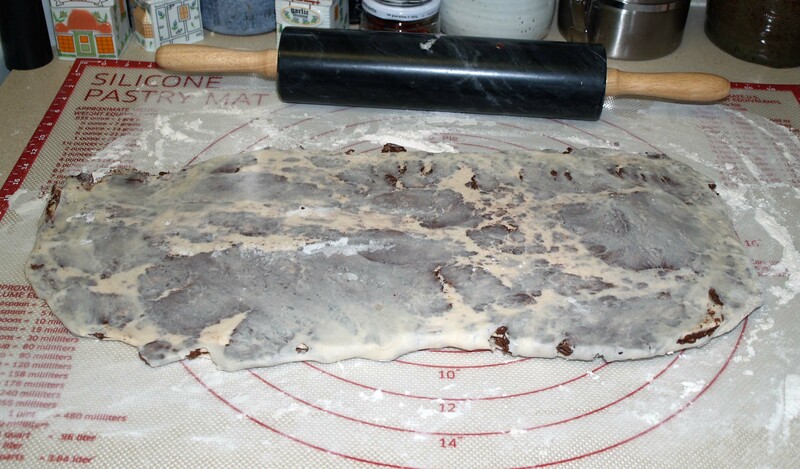 In the beginning you will need to press your rolling pin into the block so it flattens. 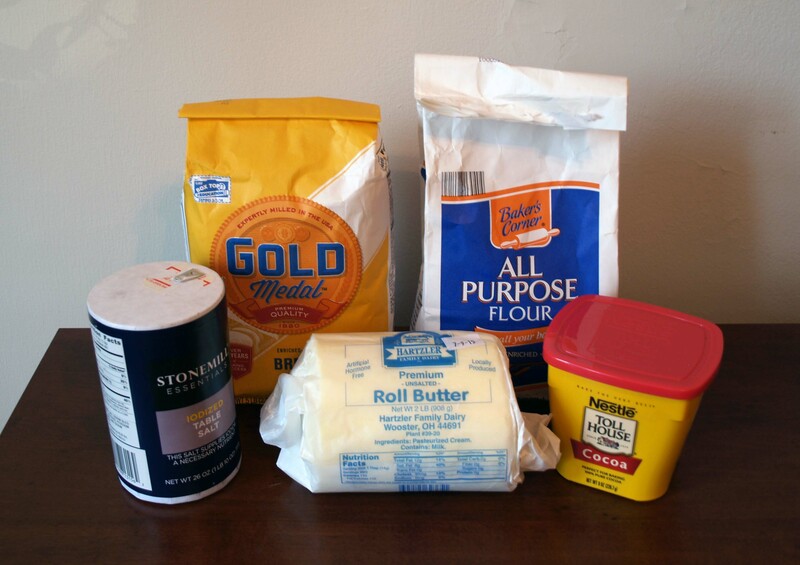 Be careful not to let the butter block break through the dough. 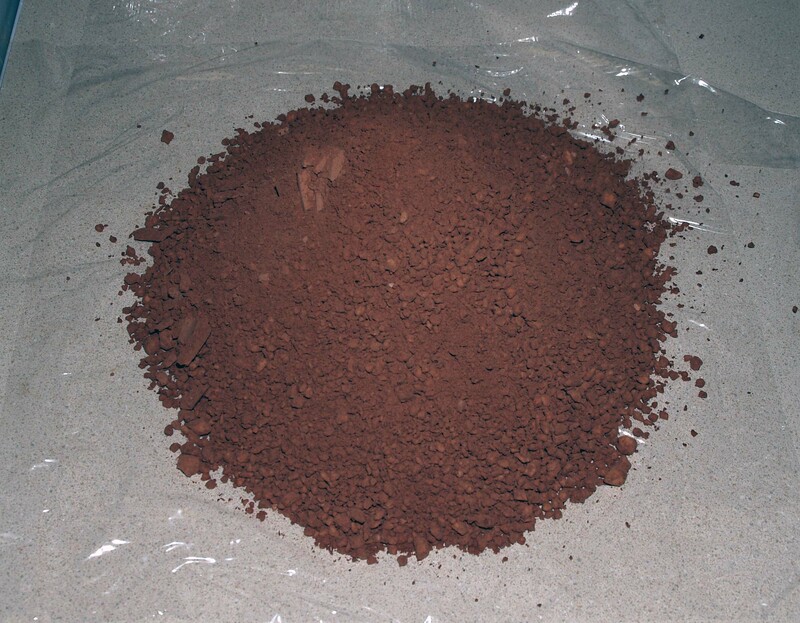 You can see that mine started to do so below. 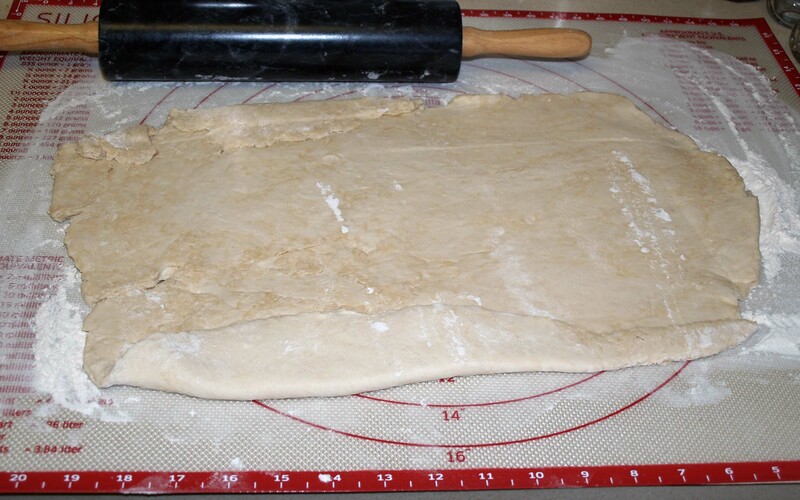 Roll the dough out into a 17″ x 7 1/2″ rectangle. Fold the rectangle in thirds like a business letter. 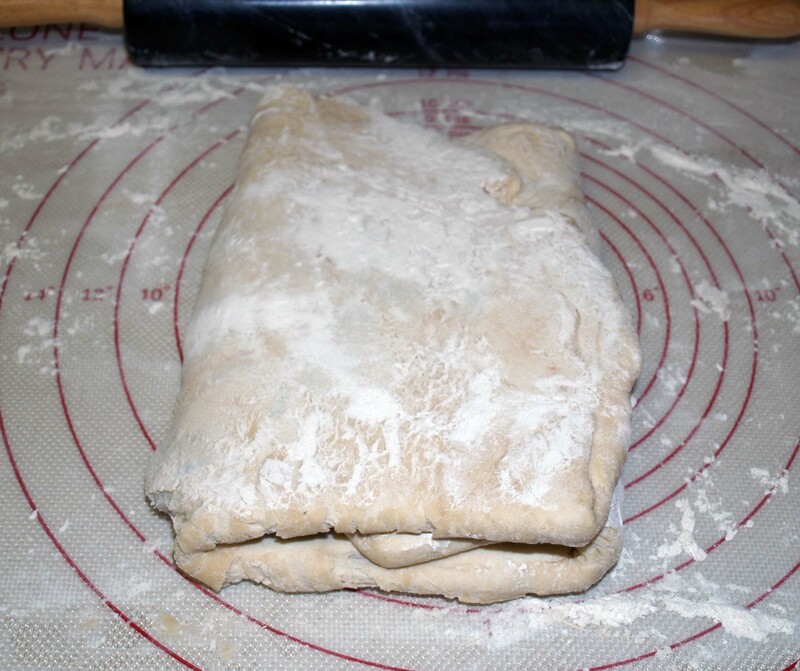 Turn the dough and roll out parallel to the folded sides into a 17″ x 7 1/2″ rectangle again. 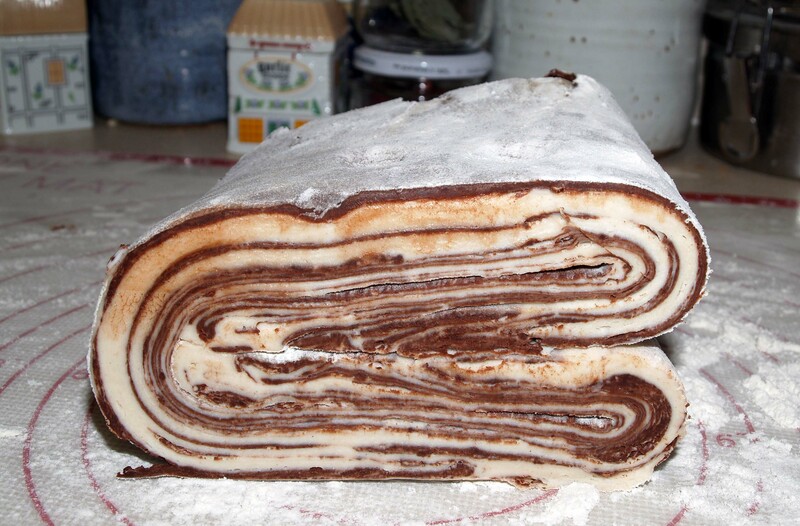 This time, fold both sides in to the middle. 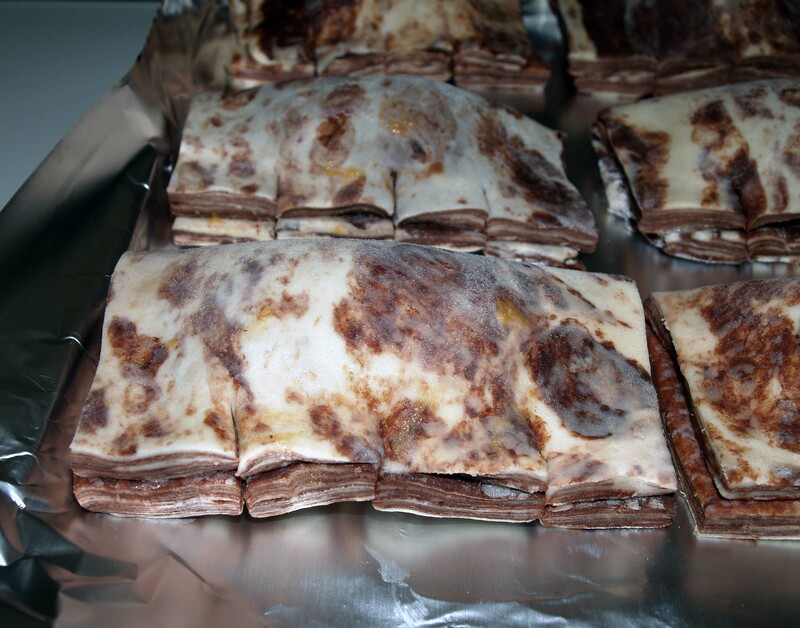 Wrap the dough in plastic wrap and refrigerate it for 45 minutes. 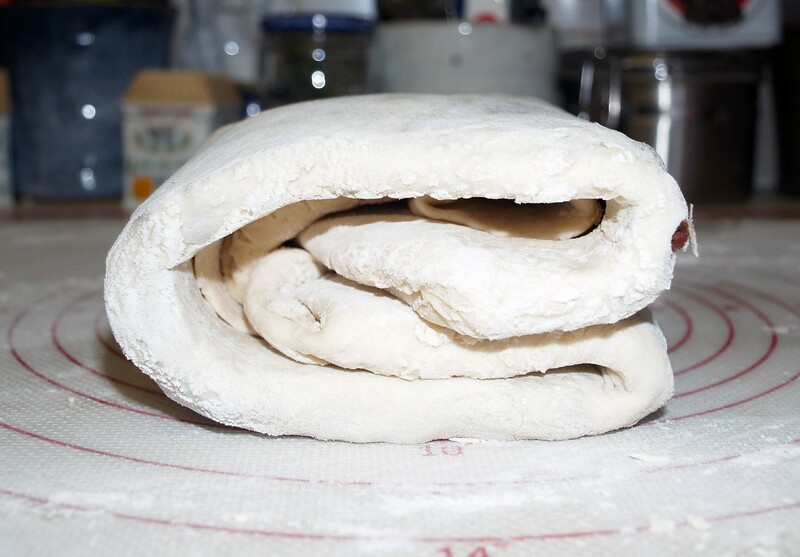 Repeat the rolling, folding, and refrigerating two more times, then refrigerate the dough for at least an hour before you are ready to use it. As you can see above, my layers broke through a bit. This probably contributed to my sub-par results. While your dough is chilling, prepare your filling. 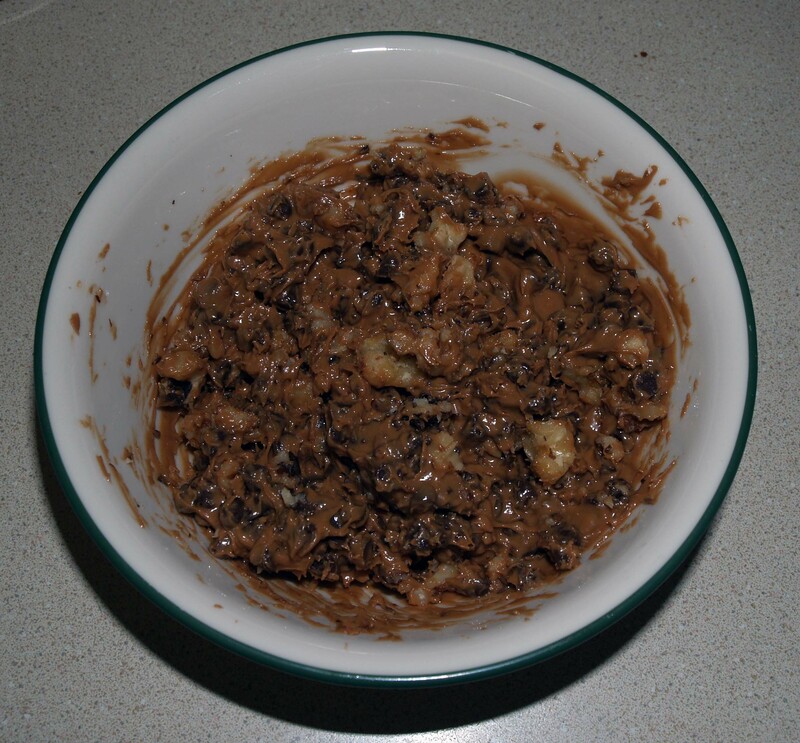 Mix together the cookie butter, chocolate chips, and walnuts. 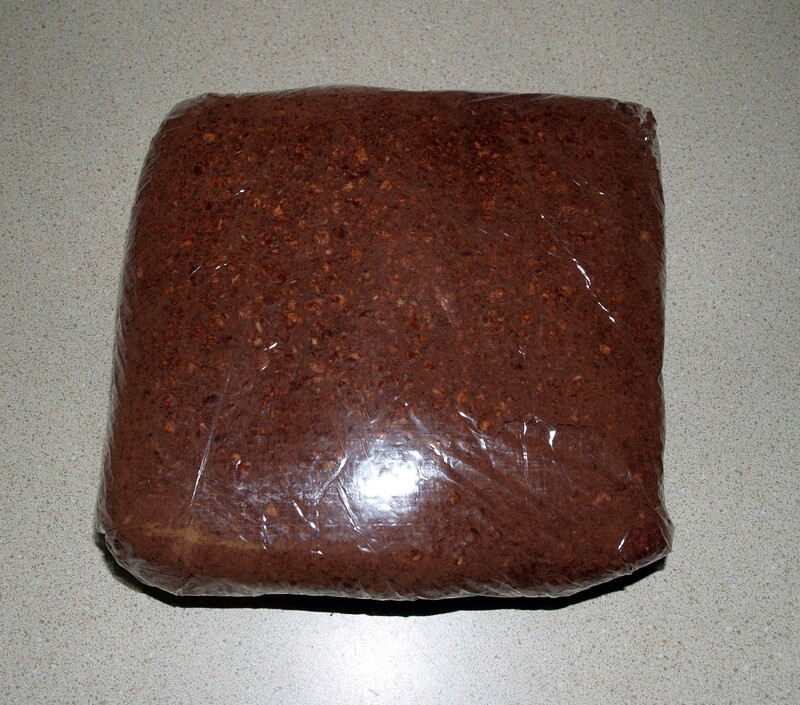 I tried this with a half batch made just like this, and a half batch which used peanut butter instead of cookie butter. I would not recommend using the peanut butter, because it seems that some of the extra oil in the peanut butter leaked out and burned during baking. 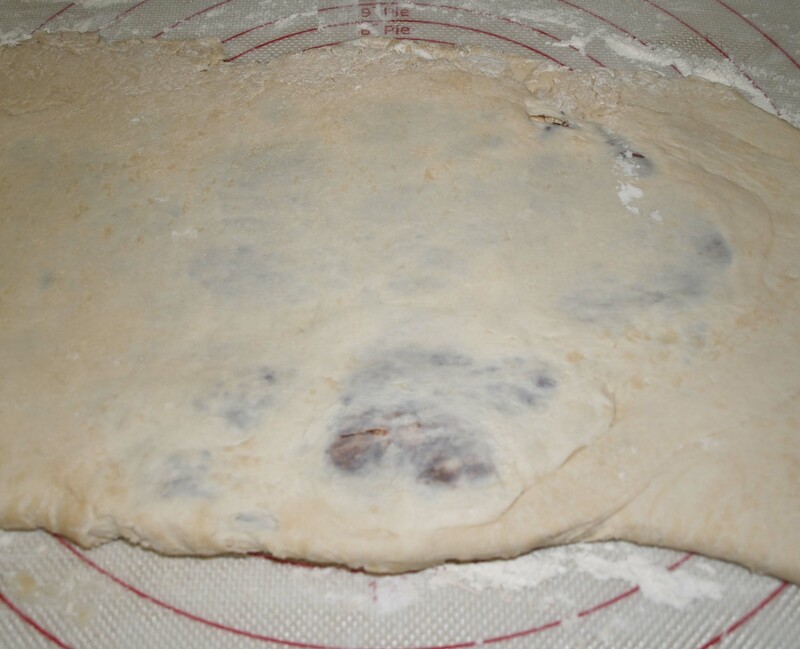 Once your puff pastry has chilled for at least an hour, cut it in half with a sharp knife and roll out one half of the dough into an 18″ x 8″ rectangle (leave the other half in the fridge while you work). Using a pizza cutter or sharp knife, trip the edges of the dough and cut it into six 6″ x 4″ rectangles. 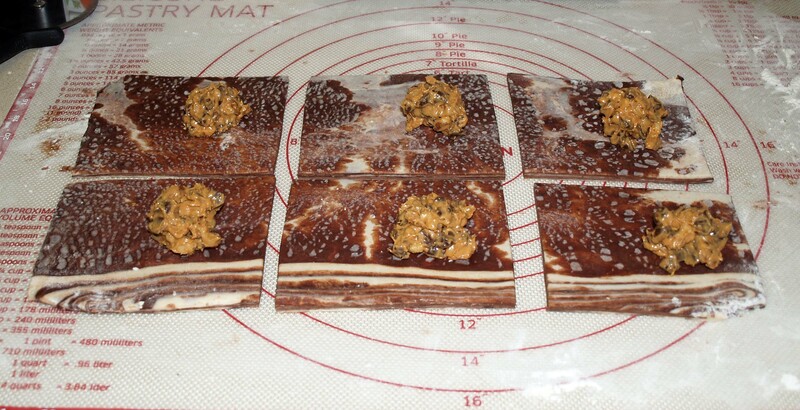 Place a heaping tablespoon of the filling onto one side of each rectangle. Brush the edges of each rectangle with water and fold them in half. 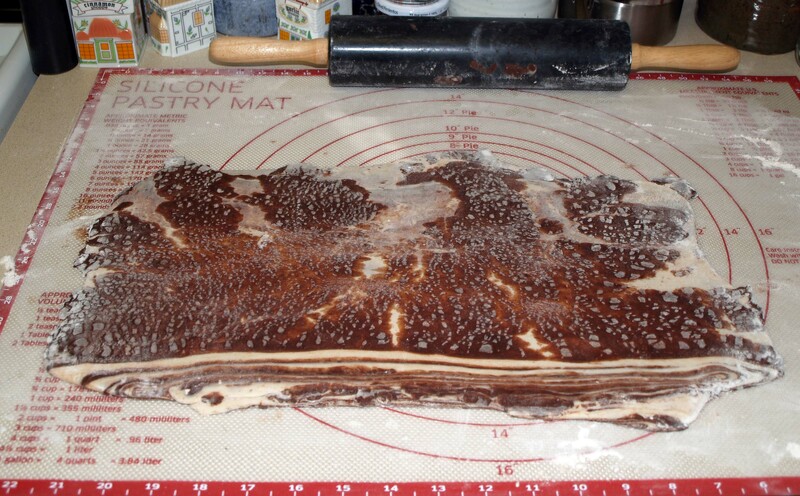 Press the edges together to seal each bear claw. Make 3 equidistant cuts in the long seam of each claw to make the toes (or 4 if you want your bears to have 5 toes). Place the bear claws on a cookie sheet and refrigerate them while you repeat the steps with the remaining puff pastry dough. Preheat your oven to 400°F. 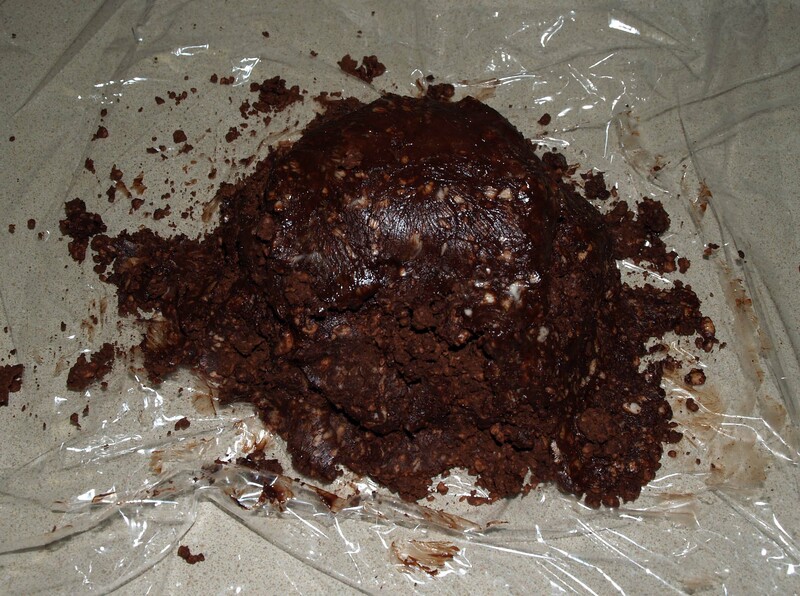 I made a mistake here too- for no good reason, I baked mine at 350°. Apparently puff pastry needs to be cooked at exactly 400° for it to cook properly. I have no idea what got into me. Be sure to learn from my mistakes and pay attention to your baking temperatures. Bake your bear claws for 20-30 minutes, watching them carefully. Remove them from the oven when they have puffed and are somewhat browned (obviously this is hard to judge because of the chocolate). I suspect baking them at too low a temperature may have allowed some of the butter in the puff pastry to melt out and burn. As you can see, these don’t look too appetizing. The filling tasted really good, and after peeling off the burnt outer layers of puff pastry, that tasted ok, but they clearly needed some improvement. If anyone has any tips for improvement or tries to bake these with my recommendations, let me know in the comments! Pingback: Bear Claws- Attempt 2 (The Easy Way) | I Wanna Bake!